Many laptops include a built-in fingerprint reader for security. This is useful to keep anybody but you from accessing data on your laptop because your fingerprint is unique. See your manual for instructions on using the reader. An option to using your finger print is using your finger to draw your password. Windows 10 has a picture password feature that works with touchscreen laptops and tablets. You enter onscreen gestures on a picture to log in to Windows. 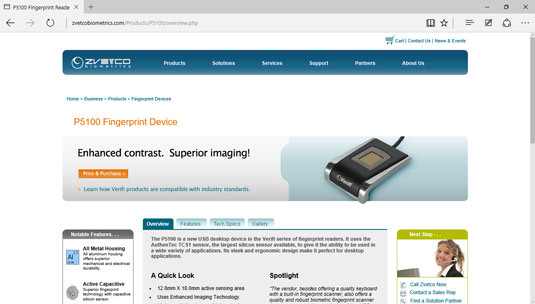 If your laptop doesn’t have a built-in fingerprint reader, you can buy an external model such as the Microsoft Fingerprint Reader. These come in a wide price range (from about $40 to $200), but they are relatively portable. Here is one such device from Zvetco Biometrics. Some fingerprint readers allow you to log in to your laptop by simply swiping your finger over the reader, and some can also store passwords for your online accounts. Laptops or tablets with a touchscreen may allow you to press your finger to the screen to read your fingerprint.